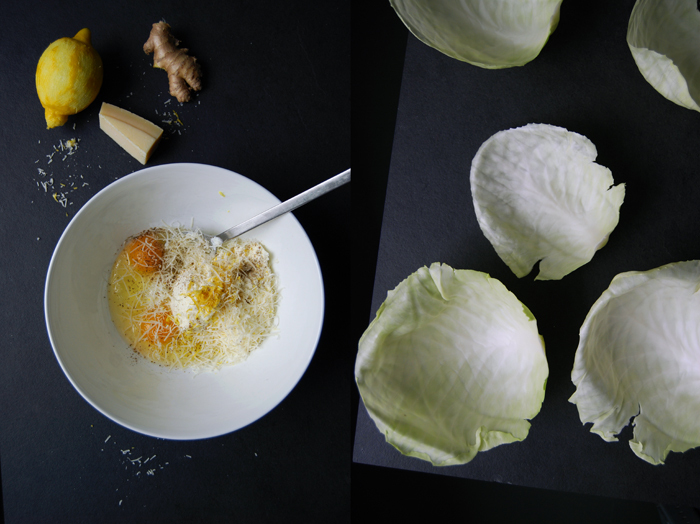 The idea for this quick lunch started with leftover ricotta in the fridge and lots of ginger roots, tons of lemons and a lonely cabbage on the kitchen counter. Sometimes these days bring out the best recipes! 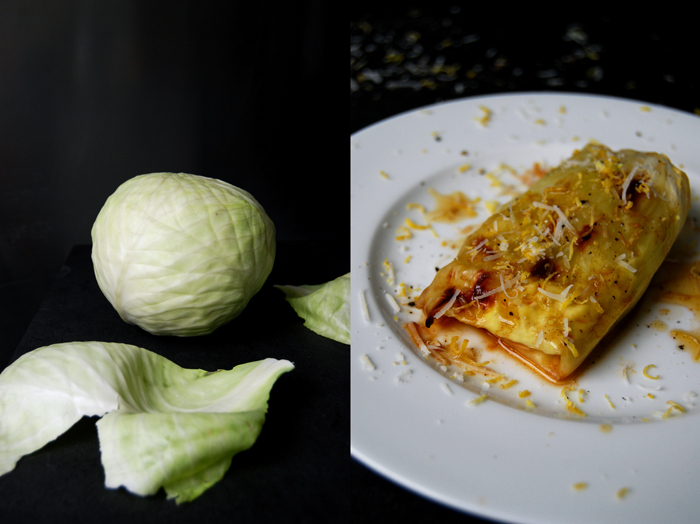 A while ago I heard about a traditional Maltese recipe which uses ricotta and raisins to stuff white cabbage leaves. The raisins didn’t strike me as much, although I want to try it one day, but the ricotta caught my attention. I mixed it with some eggs, parmesan and lemon zest like I did for my Moussaka in May and I also added plenty of tangy ginger, that gave the whole dish an Asian inspired touch. The large leaves were blanched for just a few minutes, the filling was whipped together even quicker and off it went into the oven. My rolls turned out more like packages, I just lack the skill and patience, but that didn’t do them any harm. I served them with fresh lemon butter and even more zest, cheese and ginger on top. We were more than impressed! Heat the butter in a sauce pan with the lemon juice. 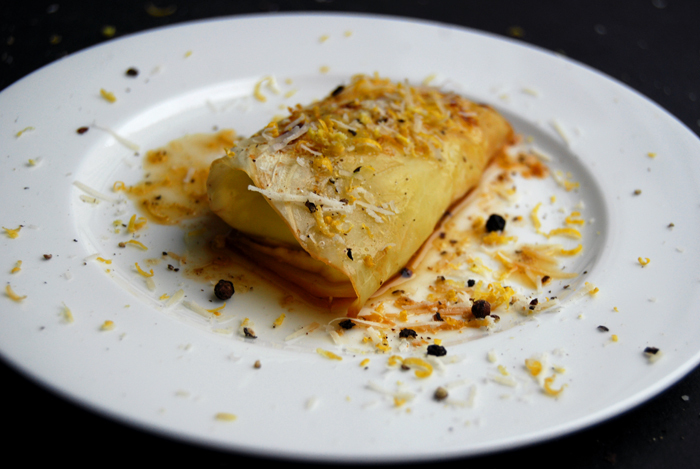 Whisk the ricotta, eggs, parmesan, zest, ginger, salt and pepper and season to taste. Blanche the cabbage leaves in lots of salted water for about 4-6 minutes or until soft. Rinse them under cold water, drain them and cut out the hard stalk. Dry them with a kitchen paper and lay them flat on the kitchen counter. 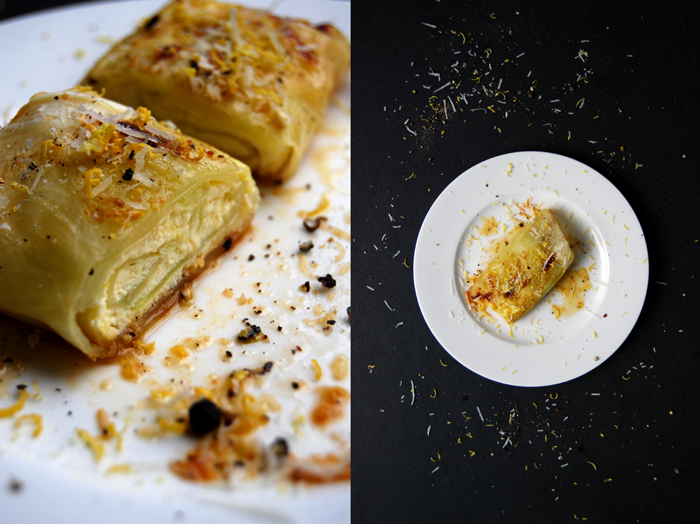 Put a tablespoon of the ricotta filling in the middle of the cabbage leaves, fold up both sides and roll it up. 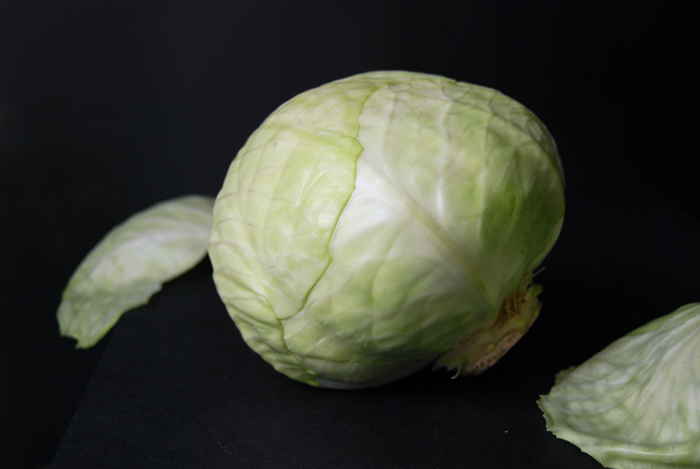 Gently place the cabbage rolls in a baking dish and cover the bottom with a splash of white wine and some water. You might have to add some more water while the rolls are cooking. Cook in the hot oven for about 25 minutes or until golden and the filling is set. Serve with the lemon butter and some more parmesan, zest, ginger and pepper.